Some of us have a lot to say. We tend to be very “generous with our opinions” at times. 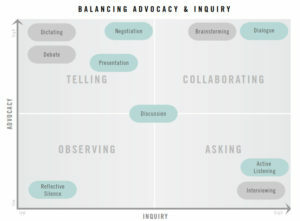 We tend to be unaware of our natural tendency toward “advocacy” before “inquiry.” Put another way, we would “tell first….ask questions later.” It’s important to understand how valuable it is to ask questions first, several in fact, and hear the other person’s perspective, before offering your own. Have you considered how much is at stake when communicating with your colleagues? 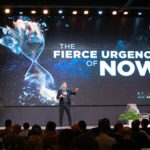 While some sophisticated leaders can intuit the best mode of communication to use in different situations, this is a topic not widely taught in management training or on-the-job leadership training. There are numerous manners of speaking, or what we call at the Stagen Leadership Academy, “Modes of Communication.” To provide managers and leaders a better map of the communication territory, we developed an X-Y chart that graphs out various useful modes of communication based on low to high “advocacy” (aka “Telling”) and low to high “Inquiry” (aka “Asking”). This produces four dimensions which we can label Telling, Asking, Observing and Collaborating and in which we can plot various modes of communication—from debate to discussion to dialogue. One of the first things you may notice is your own preference for certain modes. Perhaps you are a team player who is really fond of brainstorming and dialog? Or perhaps you are a highly directive manager who likes to just get straight to the point and let the other person know what they need to do next? You can also think of your colleagues. Clearly some are great observers and listeners, and others… well, let’s just say they are “enthusiastic advocates” for their own point of view. Most managers are trained to be “advocates”—to assert a point of view, debate, and influence—in an attempt to solve problems and achieve goals. But as they move into senior positions and confront more complex and diverse issues, advocacy that is not balanced with inquiry becomes problematic. High advocacy can polarize communication with limited possible outcomes: Either person A may win, or person B may win, or both may walk away with their views unchanged (and may not feel very good about the interaction). Most people communicate habitually—completely unaware of the broad range of choices available to them. In fact, most people use only one or two modes of communication (e.g., discussion and debate) and do not take advantage of the full range of communication modes available. Different circumstances call for different approaches to communication. People with greater awareness of a situation and a variety of modes to choose from bring greater versatility to communication and can achieve significantly better outcomes. While the chart plots ten common modes of communication, we will touch on six of the more common modes you may find useful in your day to day work environment. Negotiation (high advocacy, low-to-medium inquiry) is rarely the first tool to reach for during most interactions. However, in situations where conflict has been building and trust is low, this highly structured mode of communication can prove extremely effective. It requires two or more parties who are willing to compromise in order to resolve a difficult dispute. The goal of this mode of communication is a durable agreement between the parties. This mode (medium-to-high advocacy, low inquiry) is useful in situations where one person (or a panel) is engaged in primarily one-way communication such as giving a speech, presenting a scripted proposal, or conveying the results of a research study. This has been a dominant mode of communication in business for several decades. Conscious communicators are aware of the unilateral nature of this mode and consider additional approaches as a complement where appropriate (Q&A, asking questions of the audience, soliciting post-presentation written feedback, etc.). This mode (medium advocacy, medium inquiry) is useful in situations where the goal is to consider various points of view leading to a more informed decision. Though it obviously involves more two-way communication than presentation, it does not assume that everyone communicates inclusively or equally: Some people dominate, while others may not speak at all. Unfortunately, the term “discussion” can be a misnomer. Many autocratic/authoritarian style managers call for a discussion to simply hear the opposing views so that they can squash them. Or they may give the impression that other perspectives are being considered but intend to go ahead with their agendas regardless. Avoiding listening autobiographically (needing to jump in and talk about yourself). Summarizing key themes before moving to the next topic of conversation. This mode (high advocacy, high inquiry) seeks to get all relevant views out into the open in order to facilitate shared understanding of the issue. Dialogue is especially useful in situations where complex and/or difficult business issues need to be considered from multiple vantage points. Derived from the Greek dialegesthai, also known as “dialectical communication.” It meant to speak about something in a way that the participants came to a new understanding. Dialogue implies a reciprocal, mutually-enriching communication interaction. The main difference between discussion and dialogue is that in the latter, parties willingly set their agendas aside, suspend their interpretations and judgments, and engage active listening for the purpose of uncovering deeper issues that might otherwise not surface. Dialogue requires that both parties feel heard and understood. Because this mode is more disarming and revealing, it generally requires more trust than other modes. This mode (no advocacy, no inquiry) is perhaps the least used, yet one of the more powerful when used skillfully. Silence is useful because it gives people an opportunity to think about the topic without having to simultaneously follow one or more conversations. Some personality types (extroverts) think and analyze best during the heat of discussion. Other types (introverts) prefer to gather their thoughts internally and quietly before offering their concerns or ideas to the group. With a few moments of strategically placed silence, the group may be able to benefit from the ideas of the less outspoken members. Also, silence is useful because it can help to shift the focus or energetic tone of a meeting. It can serve as a bookend or segue from one phase of the conversation to another. Silence can also be used to invite conversation participants to reflect on their own assumptions, intentions, and/or interpretations. There are three quick, easy ways to improve your communication and bring more awareness and skill to your interactions. Always put inquiry before advocacy. Ask a question, be genuinely interested in the response, and related clarifying follow-up questions BEFORE you launch into your opinions or recommendations. Notice your own tendency to argue or debate your position. That “Debate” mode of communication is often overused. In most cases, you are on the same team as the people you are communicating with. Collaborating modes tend to work better than telling modes in most cultures. Don’t over use collaboration. There is a time and a place where it’s useful to just get straight to the point and let the other person know their best next steps. With awareness, you get a choice. The whole point of this exercise is to grow your capacity for awareness of which mode of communication will work best in which situation and to choose the right one that will increase your leadership versatility. “Conscious Communication” is taught in Q3 and Q4 of the Stagen Integral Leadership Program. To learn more about Stagen Leadership Academy and the Integral Leadership Program (ILP), please contact info@stagen.com or visit the Contact page.